VIENTIANE - Laos officially launched the "Visit Laos Year 2018" on Saturday, aiming to promote tourism and preserve unique and fine traditional culture of the country. "Over the past years, the government of Laos likewise has come to regard tourism as a priority sector for driving the socio-economic development of the country," said Lao Minister of Information, Culture and Tourism Bosengkham Vongdara while addressing the opening ceremony. 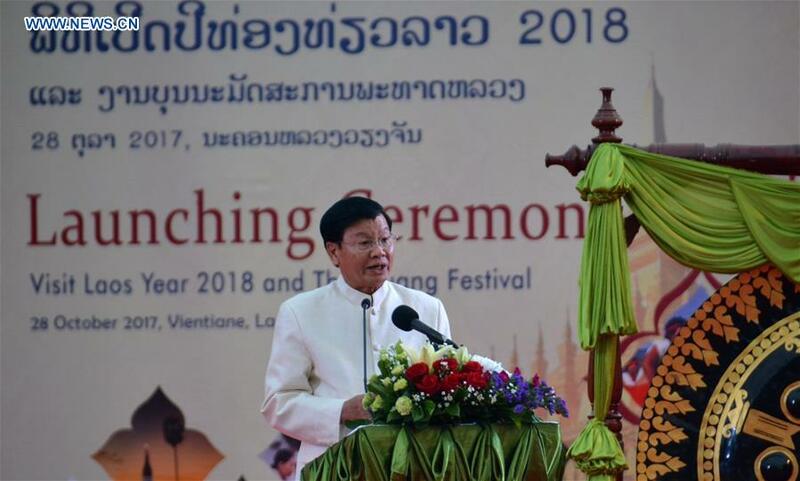 "Moreover, the government considers tourism development and promotion as a means for expanding and enhancing cooperation between Laos and foreign countries," he said, adding that the government has determined the directive for developing and growing natural tourism, historical and cultural tourism based on the Slogan of "Visit Laos Year 2018: Visit Laos, Experience the Diversity of Nature and History." Over the past years, Lao tourism sector has been constantly growing with rising numbers of tourists visiting Laos annually. In 2000, tourist arrivals reached 737,208 people and generated the income of nearly 113.9 million U.S. dollars. By 2015, the figure had risen to nearly 4.7 million people, generating nearly 725.4 million U.S. dollars in revenue. It is projected that tourist arrivals will reach over 6.2 million people by 2020 and generate revenue of more than 993.4 million U.S. dollars. "During 'Visit Laos Year 2018', we will seek to attract at least 5 million arrivals and generate revenue of about 900 million U.S. dollars," said the minister. The "Visit Laos Year 2018" will comprise activities to be organized in Laos and overseas including festivals in various provinces across the country. Laos has previously organized two Visit Lao Year activities, one in 1999-2000 and another in 2011-2012 to promote tourism.